On Wednesday, a cheque of EC$5,000 was presented to Chairperson of the SVG National Trust Louise Mitchell-Joseph during a ceremony held at Coreas Hazells conference room. Jennilee Glasgow of Coreas Hazells Inc Corporate Communications Department said the company hopes to assist the National Trust in its quest to make several sites in the country United Nations World Heritage Sites. Manager of shipping at Coreas and Hazells Inc Garth Williams expressed the companyâs support for socio-cultural endeavours throughout the country and said they will continue to do so, despite the limitation of resources. He further stressed the importance of private sector involvement in assisting where possible and noted that the patronage of customers over the years made it possible for the company to continuously give back to the community. âWeâve had a partnership with the Trust over the last four years, especially with regard to our tours. And we feel that it can only grow from strength to strength if we work togetherâ¦â Williams said. 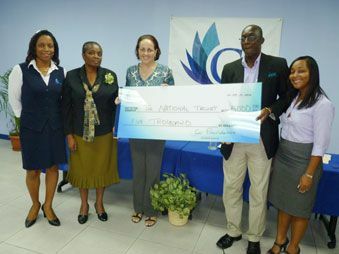 Upon accepting the cheque, Mitchell- Joseph said the donation is a validation of the work that the SVG National Trust is doing. âYou are essentially saying to us that you recognize the value of the work that we are doing. You are applauding us, for example, for the work that we have done to preserve one of the only green spaces in Kingstown â the old Public Library yard. âYou are validating us when we have a project to restore the old traditional homes with traditional architecture in Rose Place. By giving us this cheque you are saying to us that you support that project. That you are supporting working with usâ¦â Mitchell-Joseph said.